احمدی خوی, امیررضا, متقی, ابراهیم, نیاکوئی, سید امیر. (1397). آرمان‌های راهبردی و عمل گرایی تاکتیکی در سیاست خاورمیانه‌ای ایران. فصلنامه بین المللی ژئوپلیتیک, 14(49), 82-112. امیررضا احمدی خوی; ابراهیم متقی; سید امیر نیاکوئی. "آرمان‌های راهبردی و عمل گرایی تاکتیکی در سیاست خاورمیانه‌ای ایران". فصلنامه بین المللی ژئوپلیتیک, 14, 49, 1397, 82-112. احمدی خوی, امیررضا, متقی, ابراهیم, نیاکوئی, سید امیر. (1397). 'آرمان‌های راهبردی و عمل گرایی تاکتیکی در سیاست خاورمیانه‌ای ایران', فصلنامه بین المللی ژئوپلیتیک, 14(49), pp. 82-112. احمدی خوی, امیررضا, متقی, ابراهیم, نیاکوئی, سید امیر. آرمان‌های راهبردی و عمل گرایی تاکتیکی در سیاست خاورمیانه‌ای ایران. فصلنامه بین المللی ژئوپلیتیک, 1397; 14(49): 82-112. آرمان‌های راهبردی سیاست خارجی ایران ریشه در فرهنگ سیاسی و شکل‌بندی‌های محیط ژئوپلیتیکی دارد. آرمان‌گرایی بنیان‌های فرهنگی و هویتی سیاست خارجی ایران را شکل می‌دهد، در حالی​که مصالحه‌گرایی و عملگرایی را می​توان در زمره عوامل تأثیرگذار بر الگوهای کنش دیپلماتیک و راهبردی سیاست خارجی ایران دانست. پرسش مقاله حاضر آن است که: «آرمان‌گرایی و عملگرایی چه جایگاهی در روند سیاست خاورمیانه‌ای ایران دارد؟» فرضیه مقاله به این موضوع اشاره دارد که: «آرمان‌گرایی مبتنی بر نشانه‌های هویتی، فرهنگی و تاریخی سیاست خارجی ایران است، در‌حالی‌که ساز و کارهای مدیریت بحران منطقه‌ای بر اساس شیوه‌های عملگرایانه حاصل می‌شود.» در این مقاله از دو رهیافت هویتی و کنش عقلایی در تحلیل تصمیم‌گیری سیاست خارجی استفاده شده است. روش شناسی این پژوهش مبتنی بر رهیافت تحلیلی-توصیفی و با استفاده از منابع کتابخانه​ای نظری و مستندات سیاست خارجی می​باشد. Iran Middle East Policy Which is formed according to the position and Main goles of the Iranian state in the region, has been a interesting issue for researchers in this area. The Importance of that is due to eminence of ideals and values in formal foreign policy of the country. Despite the reflection of ideals and values in rhetoric’s of policy makers; the pragmatism can be simultaneously seen in foreign policy action of Iran’s Middle East policy. The Allison organizational process and rising regional powers in international relations can be devised for better understanding of dynamics of ideal-pragmatism in Iran Middle East policy. These factors can be best explanation for analysis of that how Iranian Middle East policy as a rising regional power can integrate this volatile dynamics. 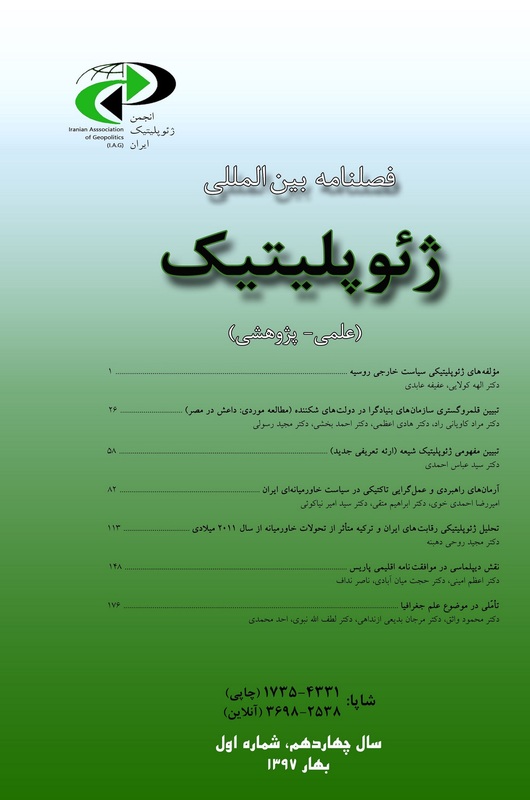 This research is based on analytical-descriptive method which with incorporating historical facts of Iran Middle East Policy after the Islamic revolution and concept of pragmatism and its interaction with ideals in the metaphor of policy making, tries to bring an insight to the dynamics of ideals-interest. The theoretical and fact based resources are devised to understand actual and day to day policy making regarding the Middle East. This research paper draws its conceptual framework on Graham Allison’s organizational process theory. Additional to that, utilizing rising regional powers equilibrium in international relations riches theoretical analysis of the research. The conceptual framework is provided in this research enables the researchers to explain how the dynamics of ideals-pragmatism is implemented in Iran Middle East policy formation and operation.